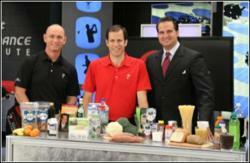 The 8th season of the Titleist Golf Fitness Academy on the Golf Channel will feature best-selling author KC Craichy on the subject of “performance nutrition.” Craichy, whose books include “The Super Health Diet: The Last Diet You Will Ever Need” and “Super Health 7 Golden Keys to Unlock Lifelong Vitality,” serves on the Nutrition Advisory Board for the Titleist Performance Institute. Monday’s premiere of the 8th season of the Golf Fitness Academy on the Golf Channel at 5:30pm ET also includes appearances by PGA Tour Player Seung-Yul Noh, Symetra Tour Player Taylor Carl, TPI Head Athletic Trainer Lance Gill, and TPI Advisory Board Member Robert Yang. Check your local listings for where you can watch Monday’s show on the Golf Channel from 5:30-6:00pm ET.